The exact cause of psoriatic arthritis is not known. Many factors seem to be involved in its development. Heredity--your genes--plays a major role. People who are closely related to someone with psoriatic arthritis are 50 times more likely to develop the disease themselves. Recent studies have located genetic markers shared by most people who have the disease. A detailed medical history, with questions about psoriasis in your family, will help your doctor make a diagnosis. Patients with psoriasis may have other forms of arthritis, and the symptoms of psoriatic arthritis often look like other types of joint disease. This means that your doctor will probably do tests to rule out other diseases. Blood studies will help rule out RA. (The RA test is usually not positive in patients with psoriatic arthritis.) Efforts are being made to find ways to identify psoriatic arthritis through a blood test. The presence of specific biologic elements called biomarkers (biologic evidence of disease) would make it possible to look for evidence of this disease before it progresses â or even before it starts. Psoriatic arthritis is common in people who test positive for HIV, the AIDS virus. As a precaution, your doctor may test your blood for HIV, especially if your symptoms are severe. Physicians must also use other diagnostic tools such as X-rays, ultrasonography, and MRIs. Each one of these tests provides a little different information. 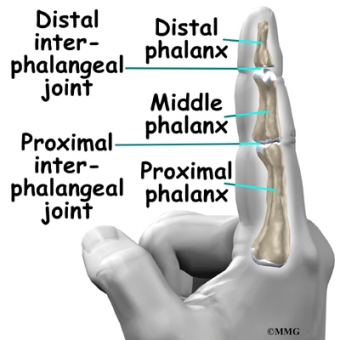 For example, X-rays of affected joints will be studied both to rule out other diseases and to identify characteristics of psoriatic arthritis. Ultrasonography, the use of sound waves to create a picture of what's going on inside, provides a better look at the whole package: bones, joints, and soft tissues. This diagnostic test is also noninvasive and does not expose the patient to any radiation. Ultrasound also has the ability to show small changes in the nails and early signs of inflammation in tendons and small joints. 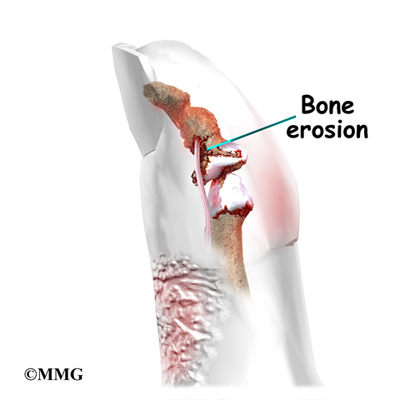 MRIs can show bone marrow edema, tenosynovitis, and early joint erosion. Tenosynovitis is the inflammation of the fluid-filled sheath (called the synovium) that surrounds a tendon. But reliability is a problem with MRIs because what one examiner sees may not be the same as another observer. Changes in the small joints of the hands and feet don't show up well on MRIs like they do with ultrasonography. One advantage MRIs do have over ultrasonography is the availability of whole body MRI. By scanning the entire body, it is possible to identify areas of inflammation undetected by clinical exam. 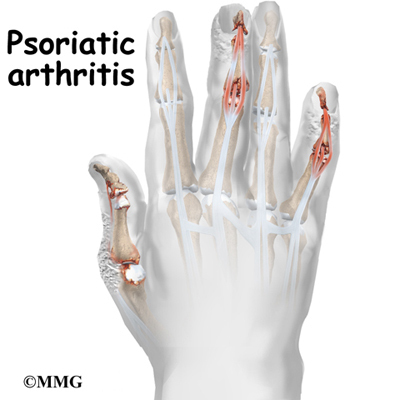 Until blood studies are able to find biomarkers indicating the presence of psoriatic arthritis, physicians will probably have to use a combination of different tests to diagnose the problem. The information these tests provide is important in determining treatment. Dealing with psoriatic arthritis involves treating both the skin lesions and the joint pain. Many lotions and creams are made for skin affected by psoriasis. If the skin involvement is especially severe, your doctor will most likely prescribe a drug called methotrexate. Methotrexate can also help with the arthritis. PUVA therapy may be helpful for both the skin and joint problems. PUVA therapy uses topical cream medications that are rubbed on the skin lesions. Following application of the cream, the skin area is placed under a lamp that emits a special ultraviolet light. The light triggers chemicals in the medication cream that treat the rash lesions. Treatment of arthritis symptoms depends on which joints are affected and the severity of the disease. The first drugs most doctors prescribe are nonsteroidal anti-inflammatory drugs (NSAIDs). Aspirin and ibuprofen are NSAIDs, as are many prescription pain relievers. Other medications known as disease-modifying antirheumatic drugs (DMARDs) are used in patients with high levels of pain or especially bad arthritis. These medications work in different ways to regulate the immune system and thereby control the arthritis. One of the most commonly used disease-modifying medication for the treatment of psoriatic arthritis (PsA) is methotrexate. DMARDs like methotrexate not only control symptoms, they also slow the progression of disease. That's what makes them "disease-modifying". For some patients, it may be necessary to combine methotrexate with another drug (e.g., infliximab) to get the desired results (decreased joint pain, swelling, and stiffness). Infliximab is a type of disease-modifying medication in a class called anti-tumor necrosis factor (TNF) agents. The anti-TNF agents are a special type of antibody referred to as human monoclonal antibodies. They specifically target (and inhibit) tumor necrosis factor. Tumor necrosis factor (TNF) promotes the inflammatory response, which in turn causes many of the clinical problems associated with autoimmune disorders such as rheumatoid arthritis. Oral medications (pills taken by mouth) are under investigation that might be available in the future for the treatment psoriatic arthritis (PsA). These include ustekinumab, apremilast, and tofacitinib. Each of these medications works in a slightly different way to regulate the immune system. Doctors will sometimes prescribe a combination of drugs. Cortisone injections into sore joints can help relieve pain. Surgery may be called for in the rare cases of unmanageable pain or loss of joint function.